It's no new idea or concept, since you all know bitmap animations cost less cpu than vector ones in flash. To improve the efficiency is to simply draw every frame of the movieclip first, and then put the right bitmapdata to stage. 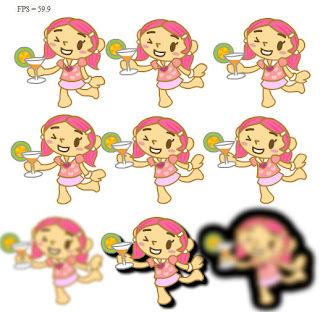 Although it would need more memory but somehow can reduce the loading of cpu, the flash animation will run smoothly. It came to me two years ago when I read the blog of ByteArray.org, who introduced his Banana Slice Component which is doing the same thing. Yes, two years ago. I was busy then and basically I personally really don't like to use component, so I decided to make one my own later some day. But you know, busy, and the thought was just a thought util now. Sooner or later I have to face the efficiency of the animation, so I took one day to finish my classes. Two classes, one is for the movieclips which already exist in the stage. Just set the movieclips to extend the AniClipExt class in the library window and the class will automatically replace the frames into bitmapdata. Another class is for programers. You can new a AniClip instance and asign which movieclip to be drawn. As ByteArray.org, we need demos to show the efficiency difference between vector animations and bitmap ones. So the demos are below. First is the original one. Just animations. I placed nine same vector animations to stage, and added some filters to the last three ones to make cpu cry louder. Please click here to see the fps. And here is AniClipExt demo. In this demo I additionally change the fps for each clip. AniClip version gets almost the same fps. I believe you can see the difference between them. At least I got improvement on my pc. The original swf is around fps 40, and the fps is aound 60 after bitmapdata drawing. The difference would be larger if the animation uses more complicated objects. 1. Because we draw every frame, the children of the movieclip will lose their properties or methods, if they are also animations or buttons. 2. The hitarea will be changed. Same reason, bitmapdata. 3. The linestyle thickness won't be count as the width or height of the movieclip, so I have to add one property named "_border" to draw larger area than the width/height values. You can change the value if you need. 4. Sometimes designers would make the animations to x < 0 or y < 0, so I had to get the really rectangle of the movieclip to make the bitmapdata to draw the entire area at runtime. But you can change the rectangle while you use AniClip. 5. Cpu may go high when the bitmapdata is drawing. It can't be solved yet. AniClip/AniClipExt class will draw 20 frames and then rest 100 ms for another 20 frames to prevent the overloading of cpu at the same time. PS: The animation of demos is by Titan Lee. Thanks to him. 1. 07/29/2010 : Fix some bugs, and add a new method "setDetail" to redraw the frames. Please download the new one if you had downloaded the previous version.